This storybook cottage design charms onlookers with striking roof lines and a mixed exterior of stucco, stone and cedar shakes. The foyer welcomes an open floor plan with a column accented dining room and a dream, island kitchen overlooking the great room. Outdoor living is abundant with screened and open rear porches and a patio. The master suite enjoys excellent views from an arched wall of windows while the master bathroom is a spa-like retreat. Notable features include an oversized utility room, pantry, mud room, and multiple storage closets throughout. 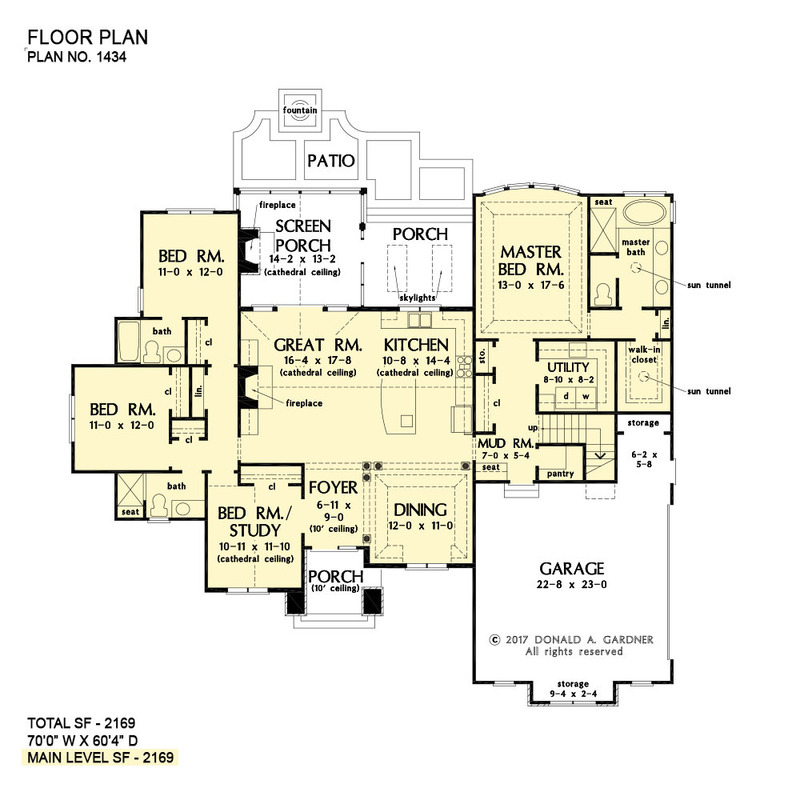 Two additional bedrooms, two full bathrooms, and a flexible bedroom/study round out this thoughtful floor plan. 1st Floor: 2169 Sq. Ft.
Porch - Front: 68 Sq. Ft.
Porch - Rear: 121 Sq. Ft.
Porch - Screened: 205 Sq. Ft.
House Dimensions: 70' 0" x 60' 4"
Great Room: 16' 4" x 17' 8"
Master Bedroom: 13' 0" x 17' 6"
Garage Storage Bay (Flat): 9' 4" x 2' 4" x 0' 0"
Mud Room (Flat): 7' 0" x 5' 4" x 9' 0"
Storage (1st Fl.) 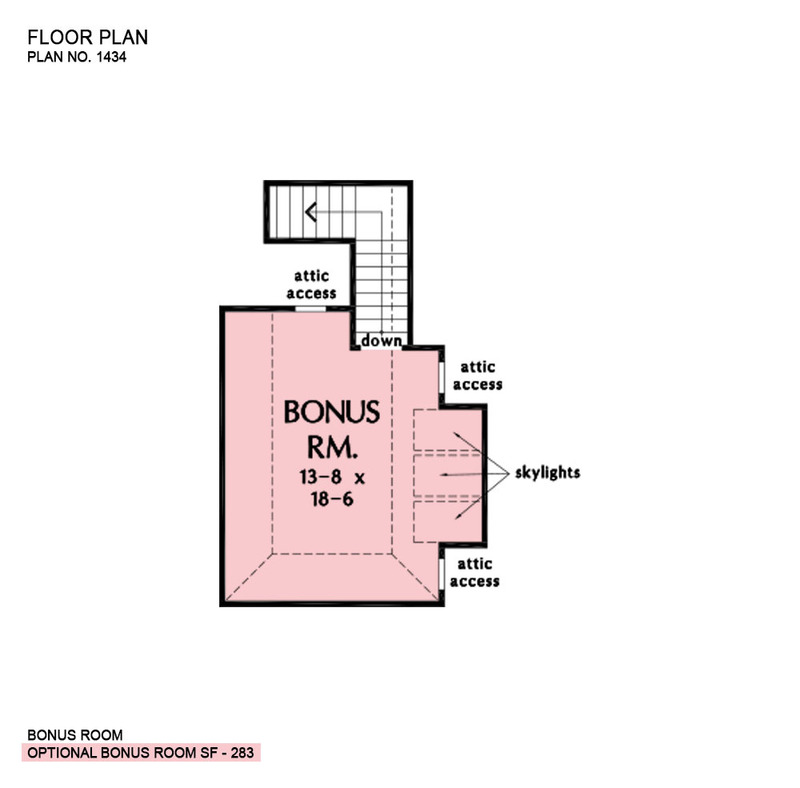 (Flat): 2' 0" x 3' 8" x 9' 0"
Foyer (Flat): 6' 11" x 9' 0" x 10' 0"
Dining Room (Tray): 12' 0" x 11' 0" x 11' 6"
Great Room (Cathedral): 16' 4" x 17' 8" x 16' 0"
Kitchen (Cathedral): 10' 8" x 14' 4" x 16' 0"
Utility Room (Flat): 8' 10" x 8' 2" x 9' 0"
Bonus Room (Clipped): 13' 8" x 18' 6" x 8' 0"
Garage (Flat): 22' 8" x 23' 0" x 0' 0"
Garage Storage (Flat): 6' 2" x 2' 0" x 0' 0"
Master Bedroom (Tray): 13' 0" x 17' 6" x 10' 6"
Bedroom / Study (Cathedral): 10' 11" x 11' 10" x 12' 9"
Bedroom #3 (Flat): 11' 0" x 12' 0" x 9' 0"
Bedroom #4 (Flat): 11' 0" x 12' 0" x 9' 0"
Porch - Front (Flat): 6' 11" x 7' 6" x 10' 0"
Porch - Rear (Flat): 12' 8" x 9' 10" x 9' 0"
Deck / Patio (None): 15' 6" x 9' 0" x 0' 0"
Porch - Screen (Cathedral): 14' 2" x 13' 2" x 14' 11"